2018 is coming to an end, and it’s fair to say that it’s been a pretty great year for gaming. But just as we looked forward to this year’s games the year before, the gaming world is now shifting its attention towards the several titles in 2019 that are expected to make a real bang at launch. Needless to say, the number of triple-A titles for 2019 are numerous, with some being more anticipated than others. To that end, my colleague Ian and I thought to compile and share with you the games that we’re most looking forward to. Announced earlier this year, Anthem is a game created by legendary developer BioWare, and published by EA. Specifically, the game is the first brand new IP since Dragon Age Inquisition and the doomed Mass Effect installment, Andromeda. Initial impressions and gameplay footage makes the game look hybrid between Destiny 2, Tom Clancy’s The Division, with just a hint Dragon Age Inquisition thrown into the fray. Anthem is slated for a 22 February 2019 release. Blood and gore. Glory kills. A protagonist with breathtaking anger issues. Unnecessary showboating. A world overrun by demons. 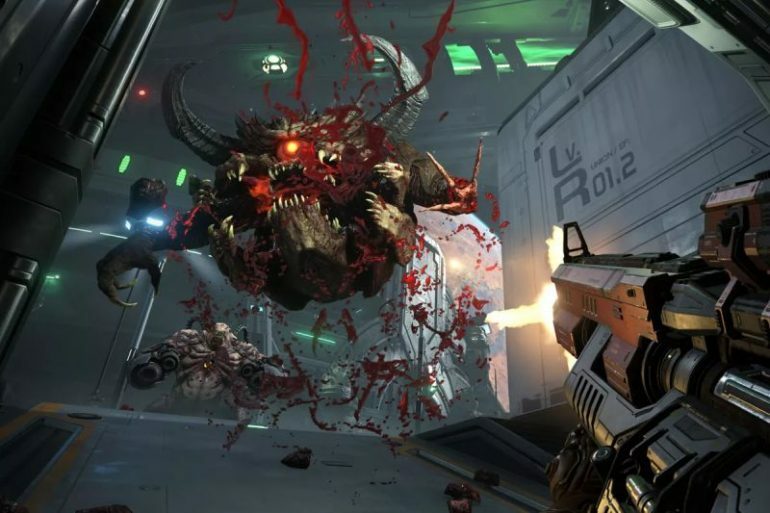 Just like the reboot that launched back in 2016, Bethesda’s sequel, Doom Eternal, is shaping up to be just as bloody and satisfying to the core. Seeing how I grew up playing the original Doom and the reboot, this is one game I truly can’t wait to play sooner rather than later. Doom Eternal is slated for release next year, but as of yet, the good people at Bethesda and id Software have yet to provide an exact date of launch. Announced during The Game Awards 2018, Far Cry New Dawn is the next installment in the Far Cry series. Surprisingly, the game is a sequel to Far Cry 5, and it’s also the first time that Ubisoft has ever released a sequel to a previous title. Set 17 years after the events in Far Cry 5, players will now take on the role of a yet to be named protagonist who must brave the onslaught of the new world created by the nuclear holocaust brought about by Joseph Seed, the antagonist from the last game. Far Cry New Dawn is expected to be available on 15 February 2019. Metro Exodus is set in the year 2036, two years after the events of Metro Last Light. Players will be placed in the shoes of Artyom, the original protagonist from the last two games. This time, Artyom will need to journey far east into uncharted territory. Beyond that, not a lot is known about the game’s full story as of yet. Metro Exodus is slated for a 15 February 2019 release. The same time as many other titles, such as Far Cry New Dawn. Ori and the Will of the Wisp is slated for a 2019 release, but like most prominent titles, it still hasn’t received an proper launch date. Considered one of the best-selling titles of the franchise, players will once again be able to revisit the infested Raccoon City in new and ultra high definition detail. Just as before, players will have to traverse through and escape the zombie-riddled city, and solve puzzles as either Leon Kennedy or Claire Redfield. The Resident Evil 2 remake is set to launch on 15 January 2019, just two weeks before the release of Kingdom Hearts 3. The first glimpse of Cyberpunk 2077 came about back in 2013, with an official trailer for the game having been released a little more than six months ago. Three months after that, the game’s developer put up the 48 minute play demo that you see above. To be fair, this title is really just a longshot and I am really, truly hoping that the CD Projekt Red (CDPR) will actually be able to pull a Hail Mary and release the game by this year. At this moment in time, however, any further development of the game is shrouded in secrecy, with CDPR using John Carmack’s infamous “It’s ready when it’s ready” motto. Originally announced for 2017, Ace Combat 7: Skies Unknown will finally be released early next year. In fact, it will be out 18 January 2018 for consoles, and 1 February for PC. The story revolves around callsign Trigger, a pilot for the Osean Air Force who is accused of murdering a former president, and is sent to the penal military unit Spare Squadron as a result. Ace Combat 7: Skies Unknown will be released on 18 January 2019. The true sequel of the series finally comes, a whole decade after Devil May Cry 4. Dante returns from his journey to the demon world, and a mysterious figure robs Nero of his Devil Bringer arm. Newcomer V also adds a completely new gameplay style to the series, with three different demons under his command. Devil May Cry 5 is slated for release on 8 March 2019. Ghost of Tsushima is probably the closest that we will get to an Assassins Creed game with a Japanese setting. It looks great, be it in terms of graphics or combat mechanics. And, in my eyes at least, it has probably the best implementation of the “Iai” quick draw in actual combat, as opposed to some fancy cutscene. Unfortunately, there’s still no specific release date for the game beyond the extremely vague 2019. The same beautiful world of the Yakuza series, but now on you play a character on the other side of the law. Takuya Kimura lends his likeness and voice to Takayuki Yagami, an ex-lawyer turned private detective as he searches through Kamurocho for the answers he seeks. The same whacky combat system as well as the addition of detective segments reminiscent of the out-of-courtroom segments of the Phoenix Wright series. Judgment will be available some time in Summer 2019. Probably the most highly anticipated game in the list, Kingdom Hearts III will finally be gracing the PS4 consoles of long-time fans. After keeping everyone waiting for half a decade since its first trailer in E3 2013, the game is finally free from the countless delays that plagued its development. Sora’s journey will finally continue, and thankfully, pretty early next year. Kingdom Hearts III is scheduled to hit stores on 25 January 2019. Technically, it’s not a new game, but as is the tradition of Monster Hunter, every G-Rank expansion comes with enough content to almost qualify as one. The expansion not only brings a new rank level, but also a new map, a few new and returning monsters, and a story continuation where the base game left off. Monster Hunter World: Iceborne will grace hunters sometime in the Autumn of 2019. Tom Clancy’s The Division 2 comes with a lot of changes over the first game. The setting is different, as are the systems and mechanics. But most importantly, the game’s playstyle variety has seen a major boost, at least based on what we know so far. But will all the other changes translate to better gameplay the way plays tyle variety will? We’ll soon find out. Tom Clancy’s The Division 2 will be out on 15 March 2019. Ian Chee contributed to this article.